Brave is Disney Pixar's thirteenth full feature animated film. For some it is lucky, yet for others it's not. But whatever people are saying about the luck of the movie, its box office sales could not deny its success. As of the moment, Box Office Mojo is reporting more than $160,000,000 box office sales and still counting. 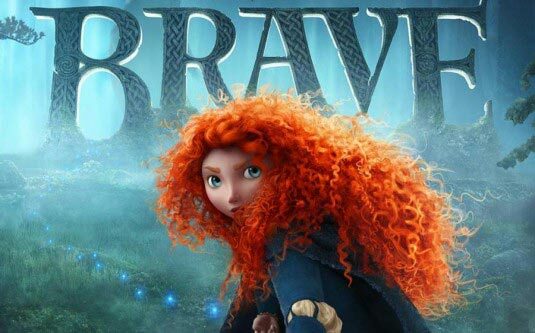 Originally titled The Bear and the Bow, Brave has set many firsts for Pixar Animation Studio. A feat many were anxious and apprehensive about before its official release. This one hour and forty minutes of Scottish fairy tale has become an instant favorite for many since then. It was also the movie that serves as a turning point for Pixar Animation Studio's history. Disney Pixar's feature films were always grounded on reality and quite not on the magical. Magic is not always involved in the story. Take Toy Story for example, despite the toys coming up to life, there are no magical fairies involved. Most of its movies are personification of inanimate things like Cars and Toy Story. Some are fables that focus on the realistic side of it such as seen in A Bug's Life, Finding Nemo and Ratatouille. Futuristic science fiction is tackled in Wall-E, while contemporary plotline is obvious in Up. A few may be a little to fantastical like Monsters, Inc. and the superhero movie The Incredibles, but all of them never involved the mgical or fairies. In Brave however, magic or a magical creature is very pivotal in it's plot, without it the story may have not pushed through. The legion of Pixar directors was always composed of men. Since the movies where mostly intended for boys, it is ideal to have male directors. The studio was once founded by male artists and tradition continued until Brave came. Pete Docter, Andrew Stanton, Lee Unkrich, John Lasseter, Brad Bird and other male directors dominated the helming scene in Pixar. Not until Brenda Chapman came into the scene when she co-directed Brave. She was supposed to be the lone director of the movie until some delays and artistic pursuits lead to her being co-director only to Mark Andrews, who is a first time Pixar director also. Woody, Filk, Sulley and Mike, Marlin and Nemo, Mr. Incredible, Lightning McQueen, Remy, Wall-E and Russell and Carl are all males or personified as male characters. A famous author once said the girls will read stories about boys, but boys seldom read stories about girls. The same principle applies to movies. That is why it is always seldom that we see females as lead characters in a Pixar movie. There are female characters of course but they are only secondary. Although their roles are important also, never has it been that the events in a Pixar story revolved around a female character -- not until Brave. Brave is focused on a female central character: Merida, a Scottish princess, voiced by Kelly Macdonald, who wanted to make a difference. Pixar movies are always based on contemporary or futuristic events. None of them touched on fictional or actual historical happenings that is mostly the focus of a period film. Since the release of Toy Story we always watched the lifestyle of the present and the future. Even the fables and the superhero movies by Pixar are rooted to the present we are enjoying. Come Brave and all of these were changed. Set in an alternate Scottish past, Brave try to tackle the culture and settings of the ancient Scotts. Chivalry, honor and royalty are abundant. It is always good to know how movie directors perceived the past -- with research or none -- because it always gives a wonder of the almost unknown side of history. 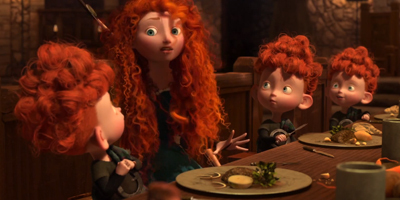 Notice the almost realist hairs on Merida and the wee devil triplets? Yes, that's the product of the ipmroved technology the the studio has been developing, hence the delay on the production. To cope with these new animating demands, Pixar rewrote their animation system for the first time in 25 years. Also, Brave is the very first movie to use Dolby Atmos sound format, a new surround technology commissioned by Dolby laboratories. It was first installed in the Dolby Theatre in Hollywood, California for the movie premier of Brave in June 2012.